“This collection of essays features the voices of real mothers – meaning, mothers talking about the things that scared, changed, and/or empowered them. As a college professor, I have been looking for a book like this for years: short and focused essays that shed light on real-life situations and feelings that I can easily pair with a research article or two. They would be a perfect supplement for courses on gender, family, parenthood, identity, etc. Undergraduate students often long to hear “real people’s voices” and these essays perfectly embody what it is like to be a real mother. WRSI 93.9 The River 5/7: Does Avital Norman Nathman care if she’s ‘Mom Enough’? Vulpes Libris 3/6: Book Review: “Reading this book, I cried, and I laughed, and then cried again, and laughed again, and frantically underlined bits to go back to. But mostly I thought: “Thank God.” Because we all make mistakes sometimes. Even if we don’t, there is always something about motherhood to feel guilty about, whether that be the fact that we didn’t bath her yesterday, or on Friday she would only eat bread. It does not make us bad parents. The Good Mother is a Myth. NYMetroParents.com 2/28: The Best of the Rest of the Web: Sunny Days, Family Vacations, and The Good Mother Myth. The Frisky 2/2: Weekend Shut-In Worksheet: Read The Good Mother Myth, Listen to Mr. Little Jeans and Eat Some Pulled Pork. Every Mother Counts 1/28: Every Mother Counts Book Club Hangout with Christy Turlington Burns. Watch the archived footage HERE. The Good Mother Myth was chosen as the January book for the Brilliant Book Club. 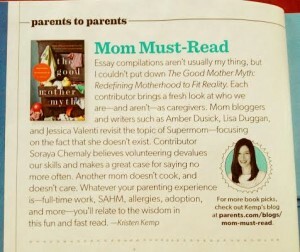 The following blogs wrote about it: Mommy, For Real, School of Smock, Urban Moo Cow, Left Brain Buddha & omnimom. Barnes & Noble 1/15/14: January Indie Roundup. 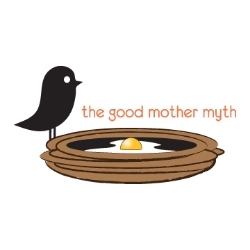 RH Reality Check 1/08/14: Why the ‘Good Mother’ Myth Has Got to Go: A Q&A.